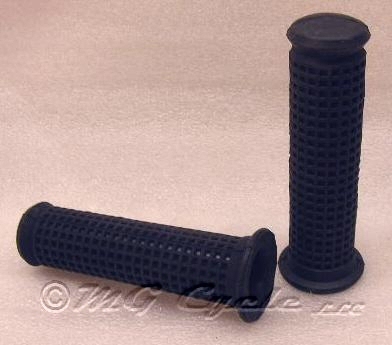 Moto Guzzi fit the same black & white grips (MG# 55603000 left & MG# 55603500 right) to all models except for models equipped with disc front brakes (MG# 14603000 left & MG# 14603500 right). 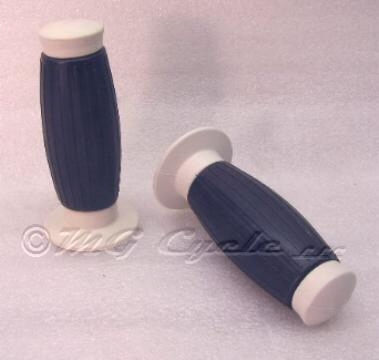 Handlebar grips fit to drum brake models: MG# 55603000 left & MG# 55603500 right. 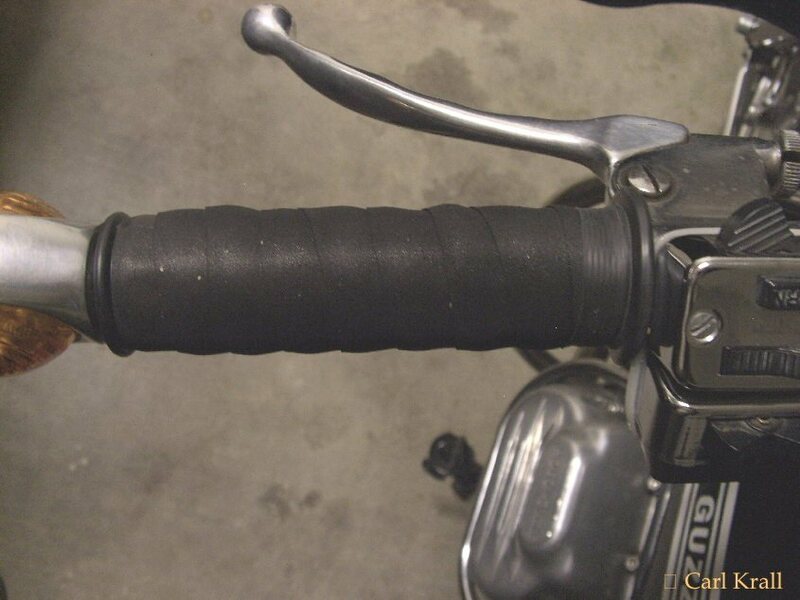 I actually took my own advice (given a long time ago, I think to you) and wrapped my grips with some bicycle handlebar tape. Originally this type was sold by Cinelli and was cork, now there are lots of non-cork alternatives with little fake bits in them to look like they are natural material. I got some that does not have adhesive, which the Cinelli does, so that I could experiment without tearing it up. I wrapped it stretched tightly. I held the stray end with a thinly stretched round of self-healing electrician's tape, also black. I have the thin black rubber grips that I think came with the Tomaselli 2C, and they are decent enough, but one round of that tape transforms the vibes, in that they no longer get through. The feel of the bars is still fully controlled, but softer. There is no sense that the tape might slip off, like a sleeve might do. So it's not a very sanitary look (was an experiment this time around so I wasn't concerned with perfection), but it's a wonderful feel, and in black it kinda hides away. I noticed how buzzy the pegs were by comparison. I could immediately see myself riding further without being fatigued, and so am thinking about what might be done with the pegs. Photo courtesy of Carl Krall.